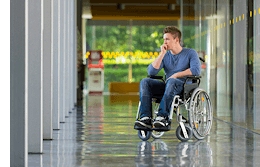 If You’ve Suffered A Paralyzing Spinal Cord Injury Call Top Dallas Spinal Cord and Paralysis Injury Lawyer David Glenn For A Free Review Of Your Case Today. Spinal cord injuries refer to any damage to the spinal cord that results in loss of motor function, sensation or partial or total paralysis. The type of function affected depends on the part of the back where the injury occurred as well as the overall severity of the injury. Each year, nearly 11,000 people suffer spinal cord injuries, many through no fault of their own. More than half of those injuries result in paralysis and most of those result in total paralysis (loss of movement or sensation below the affected vertebrae). The remaining cases suffer from a myriad of other complications and many never experience a full recovery. The odds of greater mobility increase when the injury occurs lower on the spine. The higher the injury, the greater the threat of more severe and permanent damage. If you have become the victim of a spinal cord injury through no fault of your own, you need an experienced attorney who will fight to win you compensation for your injury. In the Dallas-Fort Worth area, there is only one firm you need to call: The Glenn Law Firm. With attorneys who have vast experience fighting and winning spinal cord injury cases, they are your best option for help recovering all that you are owed. The most common causes of spinal cord injuries are automobile and motorcycle accidents. Slip-and-fall accidents are the next most common, just ahead of acts of violence and industrial accidents. Regardless of the cause, no two spinal injury cases are exactly the same. There are many variables to consider and, depending on the level and location of the injury, the actual physical damage done to the spine can be significantly different from one case to the next. Your Glenn Law Firm attorney will assess not only how the accident happened, but the extent of the damage done, the likelihood of recovery and length of convalescence among other factors. Spinal Cord Injury and the Law. At one time or other, most people will experience some form of back injury that interferes with their productivity, recreational activity or daily routine and back injury is big business. Americans spend $50 BILLION each year dealing with and treating problems resulting from back injuries. It is the most common cause of occupation-related disability and one of the main causes of missed work. Back injuries are the second most common neurological problem just behind congenital defects. If your lifestyle has been or will be permanently altered as an effect of a spinal cord injury, call the Glenn Law Firm to discuss how you can recover damages to compensate for your loss of mobility. The vast majority of spinal cord injuries occur in one of two regions: the cervical region (the top seven vertebrae in the neck) or the lumbar region (the five largest vertebrae in the lower back) And are typically the result of some sort of sudden trauma, usually the effect of impact during an auto accident, the sudden trauma of a slip and fall or deliberate blunt force trauma applied directly to the spine. These injuries can result in such complications as herniated discs, crushed vertebrae, torn ligaments, spinal fracture or various types of stress injuries to the lower back. A spinal cord injury can be a life-altering condition that can escalate to chronic pain requiring a lifetime of therapy and treatment. If you or someone you love has become the victim of a spinal cord injury, the law provides for ample compensation for your pain and suffering as well as your right to maintain your standard of living should you no longer be able to work. If you have suffered a paralyzing injury as a result of a car crash, workplace accident or due to any type of negligence, you have the right to pursue compensation for your losses. At the Glenn Law Firm, we have extensive experience handling the most difficult and complex personal injury cases, including those involving paraplegia, quadriplegia and other forms of paralysis. You need a strong advocate to help you with these complex legal matters. Dallas-Fort Worth paralysis injury lawyer David Glenn is the right attorney for your catastrophic injury case. Call us today at 817-424-5999 or arrange a free consultation. Paraplegia is paralysis of the legs and lower body. Quadriplegia is paralysis of all four limbs. Paralysis will change your life in many ways and leave you with astronomical medical costs. You may require adaptive equipment, adapted living quarters and in-home care. You may never be able to return to work. As dire as life may seem, you do have legal rights to recover compensation and make the negligent party pay for these losses. David Glenn knows how to get you the compensation you deserve. He has more than 30 years of experience handling complex personal injury cases. He has prevailed for countless clients in courtrooms and at the negotiating table and will fight tooth and nail to help you obtain the full and fair compensation you deserve. Have you or someone close to you suffered a paralyzing spinal cord injury due to the negligence or wrongdoing of another? Call us today at 817-424-5999 or contact us online to arrange a free consultation with an experienced Dallas-Fort Worth paralysis injury lawyer.